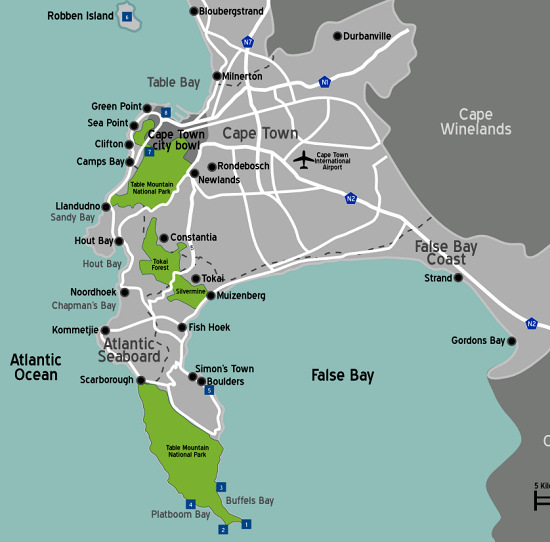 You will find the map of Cape Town and the Cape Peninsula, the Cape Town street map and Detailed map of South Africa on this page, a great help in finding your way around on the Peninsula. All of them are interactive and easy to navigate. The Cape Peninsula is situated on the south-western tip of the Western Province of South Africa. It is home to Table Mountain and the Table Mountain National Park, previously known as the Cape Peninsula National Park. On the map you will see it as a narrow stretch of land in the form of a bend finger, with the city of Cape Town at its base like a knuckle. Containing four separate sections, the Table Mountain National Park extends from Signal Hill in Cape Town, all the way down towards the Cape of Good Hope and Cape Point at the southern tip, a distance approximately 60 kilometres. It is beautiful, with awe-inspiring mountains, valleys and forests surrounded by glorious sun-drenched bays and beaches. The maps below show the Cape Peninsula. You can zoom in and out from satellite view to street view, really stunning. Follow the navigation instructions. The next map below shows the Cape Town city area, zoom in to orientate yourself at street level. You can zoom in and out from satellite view to street view, just follow the navigation instructions. Use the plus/minus button in the right-hand bottom corner or the the scroll wheel of your mouse to zoom in and out. The button in the left-hand top corner will take you to an enlarged map. This last map shows the whole of South Africa, just follow the navigation instructions to explore it. Click anywhere on the map to minimize the window in the left-hand top corner.